U.S. pharmaceutical giant Johnson & Johnson (JNJ) has finally launched its bid for the Dutch vaccine maker Crucell. Through a subsidiary, J&J is offering to buy all the Crucell shares that it doesn't already own for €24.75 (US $32.94) per share, or a total of $2.3 billion. The bid comes despite recent manufacturing problems at Crucell. The two firms first announced the deal in October. Already owning a nearly 18% stake in the small biotech company -- and collaborating with it since 2009 -- J&J sees Crucell as an opportunity to expand further into the vaccine market while gaining better access to emerging markets. But like its acquirer, which recently had to recall millions of bottles of over-the-counter children's medicines, Crucell also recently ran into some quality-control issues several weeks ago, when it stopped shipments of two of its vaccines from its plant in South Korea after concerns the plant's sterile operations may have been compromised. The offer represents a premium of 58% over the €15.70 ($20.89) closing price of Crucell shares Sept. 16, the day before the companies first announced they were in advanced negotiations. The offer will be available from Dec. 9 to Dec. 16 with a minimum acceptance level of at least 95%, which could be reduced to 80% under certain conditions. Johnson & Johnson, while known for Band-Aids, Tylenol and a variety of other health-care products, doesn't have a strong presence in vaccines. Crucell, on the other hand, currently markets a five-disease pediatric vaccine, as well as vaccines for measles, hepatitis A & B, typhoid, flu and oral vaccines "to protect the international traveler." It also has several vaccines in clinical development, to combat diseases such as influenza, hepatitis C, malaria and cholera. This potential transaction "would create a strong platform for Johnson & Johnson in the vaccine market," the companies said back in September. Crucell, meanwhile, would benefit from J&J's "expertise and experience in the development and commercialization of pharmaceutical products." The two companies have also been developing a universal influenza monoclonal antibody and a universal flu vaccine. 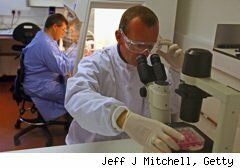 J&J now hopes it will not only further the joint programs but also build on Crucell's wide vaccine pipeline. The companies expect to maintain Crucell's existing facilities, senior management and current employment levels. New Jersey-based Johnson & Johnson also intends to keep Crucell as a center for vaccines within its pharmaceutical group, while maintaining Crucell's headquarters in Leiden, The Netherlands.